Be the first to share your favorite memory, photo or story of Joaquim. This memorial page is dedicated for family, friends and future generations to celebrate the life of their loved one. 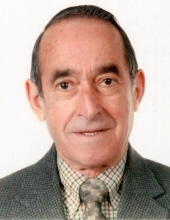 Joaquim Reverendo Dos Santos, 84, passed away on Wednesday, March 27, 2019 at St. Michael’s Medical Center, Newark, NJ. He was born in Bunheiro, Murtosa Portugal and came to the United States in 1954 and resided in the Ironbound Section of Newark, NJ. Joaquim was a Laborer/Shop Steward for James Construction Co. of Oakland, NJ and member of the Heavy and General Construction Laborers Local 472 of Newark, NJ since 1954, retiring at the age of 62. He was also a member of the Sport Maritimo Murtoense and Sport Club Portuguese, both of Newark, NJ. Husband of the late Maria Lourdes (nee Lopes) Dos Santos; devoted and loving father of Maria Filomena Santos, Manuela Gonnella and her husband Patsy and Jack Dos Santos and his wife Gina; dear brother of Beatriz Lopes and her late husband Joao, Gloria Vigario and her husband Jose and the late Antonio Dos Santos; cherished grandfather of Anthony, Nicholas and Christopher. The Funeral Services for Joaquim will be on Saturday, March 30, 2019 at 8:30 am at the Buyus Funeral Home at 426 Lafayette Street., at Wilson Ave., Newark, NJ. Thence to St. Benedict’s Church, Newark, where at 9:30 am the Funeral Mass will be offered. Interment to follow at Holy Cross Cemetery, North Arlington, NJ. Relatives and friends are welcome to attend. The visitation for Joaquim will be on Friday, March 29th from 4 - 8 pm. www.stjude.org, would be graciously appreciated it. To send flowers or a remembrance gift to the family of Joaquim Reverendo Dos Santos, please visit our Tribute Store. "Email Address" would like to share the life celebration of Joaquim Reverendo Dos Santos. Click on the "link" to go to share a favorite memory or leave a condolence message for the family.